Property Info: 2 Bedroom. 2 Bath Unit, sleeps 7. 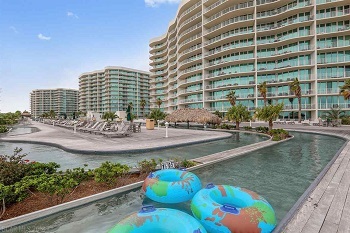 Orange Beach Alabama waterfront vacation rental at the Caribe Resort! This lovely condos has been professionally decorated, and includes a boat slip. There is king bed and twin size sleeper in the master, a king bed the guest bedroom and a full size sleeper sofa in the living room. Desirable rental home rental home upgraded stainless steel kitchen appliances, a full size washer and dryer and a kitchen that is well stocked to meet your every need!